Browse the list for quick answers to questions about Qualtrics. Visit our main Qualtrics page for videos and links to tutorials on Getting Started with Qualtrics. How can I change the background color of my survey? Go to the editor of the survey you want to modify. Click the Look & Feel button and choose Colors. Select the checkbox next to Background to bring up the color selection box. Choose the color you want from the palette or type in the color code if you know it. For example, the code for the darker McDaniel green is #003931. The code for the lighter green of the logo on mcdaniel.edu is #339933. Preview your survey! Always preview your survey to make sure that any changes you make both look and behave as expected. Visit the Qualtrics University Fonts and Colors page for more information about changing the Look & Feel of your survey. How do I make my introduction stand out from the body of the survey? Select the question that you want to modify to reveal the blue tabs across the top. Click the Rich Content Editor tab and enter or modify your information. Visit the Qualtrics University Rich Content Editor page for more formatting tips. I’m not sure what question type to use on my survey—is there a guide I can use? Yes! There is a Question Types Overview available on the Qualtrics University site. How can I be sure that my survey is mobile-friendly? Some question types are more mobile-friendly that others. Visit the Mobile Survey Optimization page for more information about making your survey mobile-friendly. How can I be sure that my survey is accessible? Go to the Survey tab and click the Tools drop-down menu. 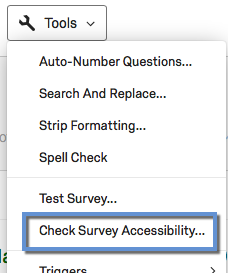 Select Check Survey Accessibility from the menu. If problems are found you’ll see them displayed at the top of your survey along with suggestions on how to fix them. Visit the Check Survey Accessibility page for more information on using the accessibility checker.